Have you ever used acrylic paint pens? I was hoping to stencil mine and I think the pens may be easiest for me. Have you had any luck with this? Thanks Melissa! Do Sharpie oil pens work just as well? I don’t think we’ve tried them on shoes. If you do, let us know how it goes. Thank you for your tutorial! It’s extremely helpful. One question, instead of applying Scotch Guard for the protective layer, can I simply use clear primer? Are they going to have different results? We’ve tried a few things like clear primer and found that if it’s a shoe that bends during wear, the top coat may crack and sometimes peel along the lines where it bends. If you do want to try it, make sure the product is suitable for outdoor use. 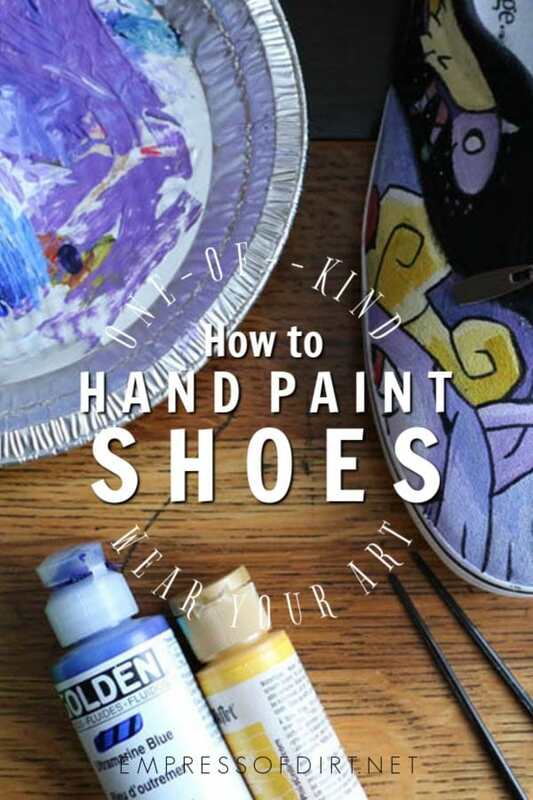 With all shoe painting, it’s ideal to have a test pair for figuring out which art materials and finish coats you like best. I recently painted a pair of canvas shoes and followed the same process you did, minus the primer. After only a couple hours of wear, they began to crack where your toes flex. How do you avoid cracking on yours? We always use primer so I’m not sure if it helps prevent cracking. Cracking seems to depend on: the shoe itself and how much it moves during wear, and top coat. Stiff shoes crack the least, of course. We have noticed that a few good, thin layers of top coat (with lots of drying time between layers) can help limit how much the shoe bends and therefore limit cracking. Also, the thinner paint is applied, the better. I hope this helps. It takes some experimenting. When we find a brand of shoe that works well, we buy a bunch of them because no two are the same. wat if i don’t use primer and paint with fabric colour/ what will be the result ?? 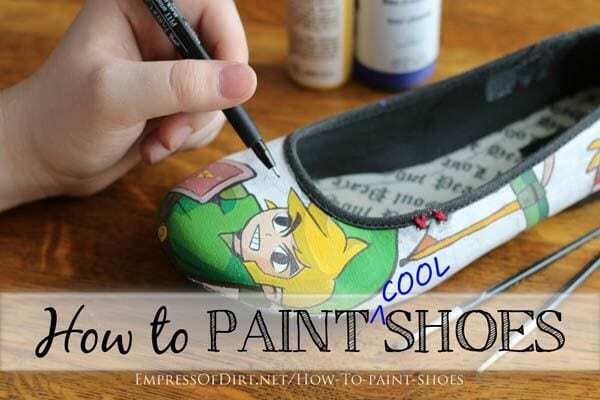 It depends on whether the shoe already has a finish on it or not that may or may not prevent the paint from adhering nicely. 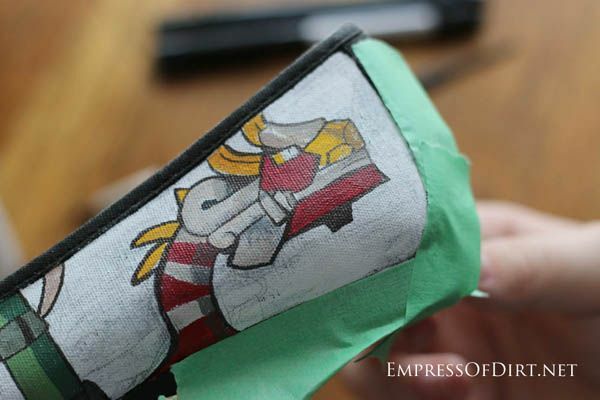 Also, colours tend to look clearer and brighter when applied to the white primer rather than the fabric directly. Because we never know exactly how a shoe will behave with the paints, we just go ahead and prime them to avoid those possible problems. If you can, get an identical test pair to experiment with. 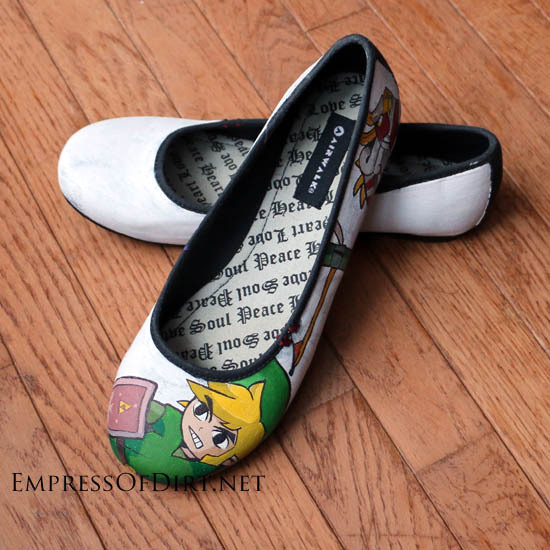 Loved the Zelda work on the shoes. I had some questions regarding sealing the paint. I actually used mostly markers and sharpies on my sneakers and its done already but Im not sure what to use for sealant. I was told a lot of people uses Krylon FInish Spray but now that I read your instructions I feel like maybe Scotch Guard is better. I know my case is a little different since I didnt use acrylic paint but i was wondering if you could give any suggestions. Thank you. Hi Jay, It really depends on the markers. Some run and some don’t. If you can, tape off a small area and test it with the sealant of your choice. Or, make a sample on a separate item and experiment there. We have recommeneded specific products we have tested but I wouldn’t want to guess for others. Alternately, you might be able to find someone who has used your exact art supplies who can confirm which sealant is best. Good luck! What are your thoughts on outdoor mod podge sealant? We have found it’s not really long-lasting for shoes you wear on regular basis. Also, with any sealant, do a small test area first to make sure it doesn’t cause the paints and markers to run or bleed. Hey! I’ve recently been planning on painting my own high tops and started painting today, but I forgot the primer! It’s already mostly dried and it’s only a small part of the shoe. Will it be ok if I prime the rest of the shoes but leave that specific area as is? 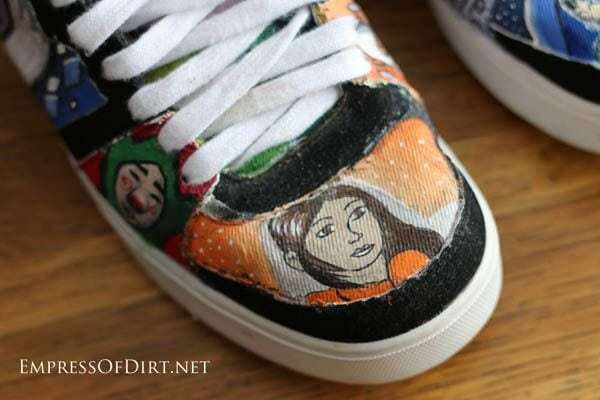 Hi Rylie, So much depends on the shoe itself and whether it has some sort of finish on the canvas already. If I was in your position, I would carry on as you described. Worst case scenerio, you might have to prime and repaint the unprimed area. Let me know how it goes. Hi Jessi, We like primer in case there are any finishes on the fabric that may affect adhesion. Also, the colours go on brighter and clearer if the base is white. It’s impossible to know what shoes someone is using so best for us to be cautious and advise this. Glad you’re getting good results! you cannot use primer, as it would be impossible to such small areas. would you use acrylic colours without primer or better use textil markers/colours? Thanks for your advice. Hi Lucia, We always use primer because otherwise the paints will not wear well. 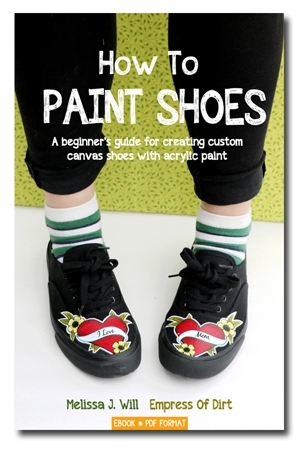 We’ve tried various markers directly on the canvas but they tend to bleed, especially if the shoe gets wet. 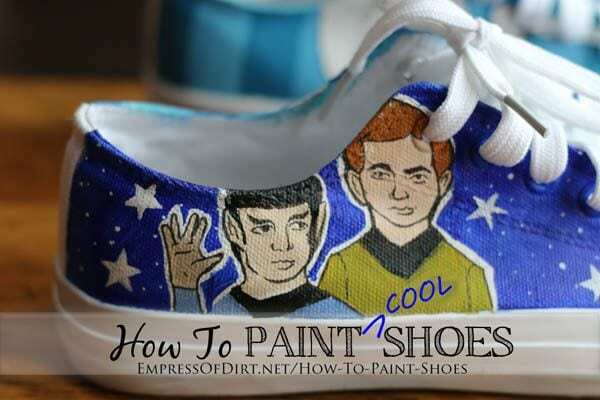 I don’t have experience with the style of shoe painting you are showing. You could try emailing whoever makes them and see if they will give you advice. Sorry I cannot be more helpful. 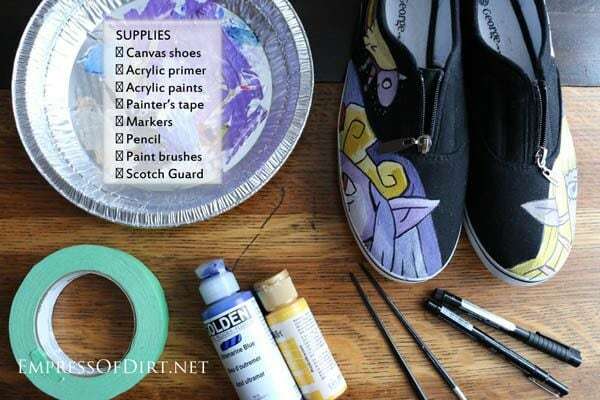 You might also try tests on old shoes with various materials to see if you can get the results you want before doing a good pair. Hello. I have painted my second pair of customs recently. My first pair cracked because I think I used the wrong sealant and paints. For my most recent shoe I used the golden brand acrylics and they work great! I have a question for my second pair about the sealing methods. So what is the difference between polyurethane and ScotchGaurd, and do you recommend applying scotchgaurd and then the polyurethane? Also, does the polyurethane make the shoes more likely to be stiff and crack after applied? Thank you! The two products are quite different. The polyurethane is thicker. The Scotchguard offers a thin, water-resistant layer. Some painted shoes are going to crack, others don’t. It seems to depend a lot on the shoe fabric and design and how much it bends during wear. Also, it definitely helps to start with a good primer and allow it to dry thoroughly before adding any paint. We have some that have stayed in top shape for years and others that slowly show signs of wear. Ultimately, I always apply polyurethane because it seems to offer the best chance for protecting the art, but there’s always exceptions. Thank you very much! Is there a specific brand of polyurethane that you recommend? I’ve always used Benjamin Moore (exterior grade) because I had it on hand for other household stuff. So, I don’t know if it’s better than others but it works very well. Always apply many thin coats, allowing each one to dry thoroughly before applying the next one. If you try it, let me know how it goes. Hi, I’m planning on repainting a pair of converse, and i’m wondering if i need the primer/a spray finish. Can I do it without? Hi Saynoris, We always prime and finish. Found there is more cracking and wear without them. I made two pair of Minecraft inspired shoes for my boys and they came out GREAT! I got a little more guts and decided to try the iron-on transfers, which worked. I was able to print the design, iron on the transfer (slowly, the shoes can’t take the heat I normally use), and painted over just the transfer with Mod Podge (the kind for fabric). I was worried they wouldn’t last long, but I made them last Christmas and they still look great! These are so much fun, thanks for the inspiration!!! Hi Cheryl, Great to hear you had such good results with the iron-on transfers. That definitely provides a super easy way to add the designs you want. Thanks for letting me know. What acrylic sealer did you use? I used the Liquitex gesso, and now having painted my shoes, I am not certain on whether I should used a “Final Varnish” type sealant, since it’s intended for regular canvas paintings. Thank you! We’ve used Polyurethane (acrylic), Scotch Guard spray, Outdoor Mod Podge, and other brush-on varnishes. Overall we like polyurethane the best for durability but every shoe wears differently depending on how it bends and moves during use. This can cause cracks or lines in the finish. Whatever you use, apply thin coats, allow them dry absolutely thoroughly and then build up layers. If you are worried, start with a test area to be sure it looks good to you and the finish is strong. After you spray the shoes with a sealant, can you then spray the shoes with a waterproofer? Hi Shannon, I haven’t tried it so I don’t know. I would try a test on a similar sample item to make sure the two things don’t discolour or negatively affect each other. I too only have access to folk art acrylic paints. I did a pair of shoes earlier this year, no primer or sealant and it cracked after a few Times wearing them. I’m wondering if using the polyurethane to seal would help it not crack. Also.. I did a pair with a textile medium, same type of shoes and the cracking was minimal but still happening. Hi Maritza, We’ve found that a sealant definitely slows cracking or prevents some but, if the shoe in places where the shoe bends and moves there is always going to be some. Dyes would be different, of course, because they are absorbed by the shoe material so no cracking would occur. Have you tried using “Folk Art” Multi-surface acrylic paint? I’ve recently used it on several canvas shoes and so far, the paint is holding up pretty good. Still, I’m afraid they will eventually crack with the normal use… I did not use any sealant or primer. Hi Klim, Yes, I like that paint. 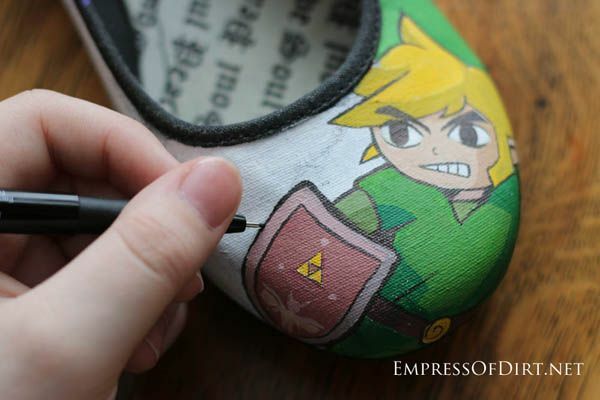 And, depending on how much the shoes bend and move in normal wear, there may be varying amounts of cracking. I’m working on a pair for my wife and have run into a slight problem. While trying to transfer a team logo on the shoe, I noticed that the graphite is almost impossible to see against the navy blue canvas of the shoe. Other portions of the shoe have been painted white before adding and image, but in this particular spot I would like to leave the blue of the shoe as a background. Any tips on how to get something transferred to a dark portion of canvas? Thanks. There are transfer papers and pencils available in white. Check a sewing supply shop or art supply store. We have never tried putting them in a washing machine. We just clean them off with a damp rag. Love your daughter’s work! 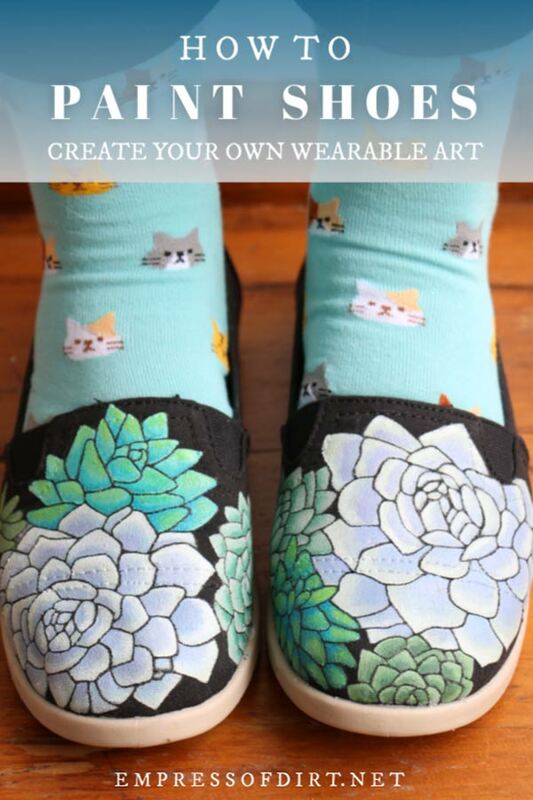 My 12 yr old has done something similar by just zentangling on the shoes with sharpies. She’s sold several pairs. I’m curious…does your daughter paint first, then sell or sell orders, then paint? We haven’t found a consistently reliable source of shoes so we’re concerned about relying on orders, but at the same time we get stuck with sizes/designs no one wants if she does it in advance. My daughter gets the customer to provide the shoes so they fit perfectly and like the shoe style. Hi Luke, We don’t wash the shoes. We apply polyurethane to protect the paint and just clean them with a damp rag.